When creating classes in Setmore, you usually have to add each class session one at a time. 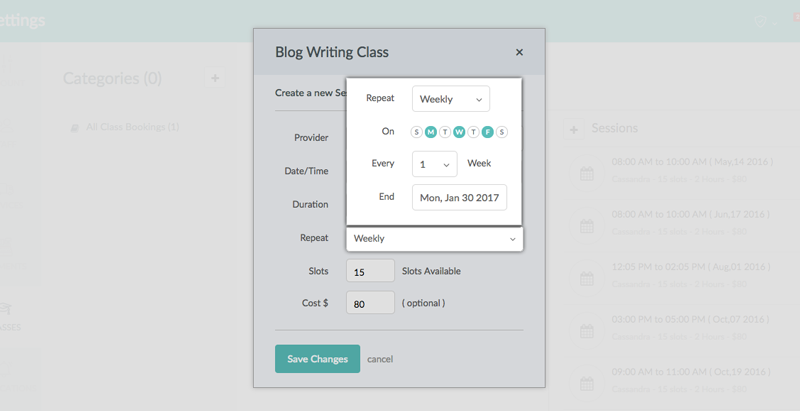 However, if you have Setmore Premium, you can create a series of class sessions all at once, to repeat at an interval of your choosing over a customizable range of dates. This will save you the time and hassle of having to manually figure out and plot each class session. 1. 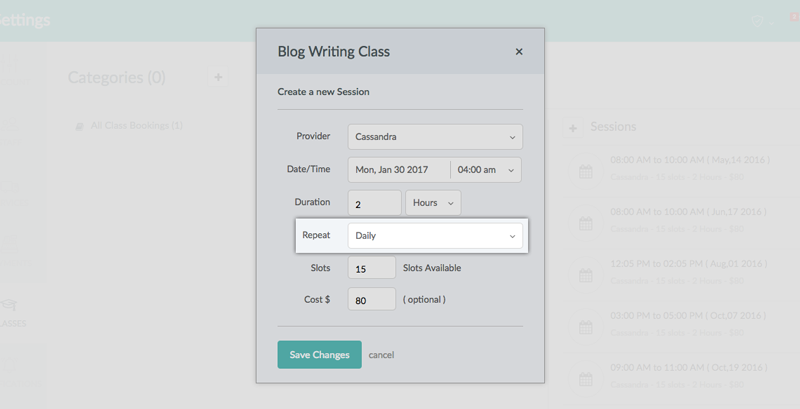 Navigate to Settings > Classes and select the class you would like to create a recurring session for. Now click the "+Session" button, near the middle-top of the screen. 2. In the "Create a New Session" window, find the "Repeat" option. Use the dropdown menu to choose between a daily, weekly, or monthly schedule. 3. In this example we chose weekly, which gives us the option to repeat the class on specific days of the week. 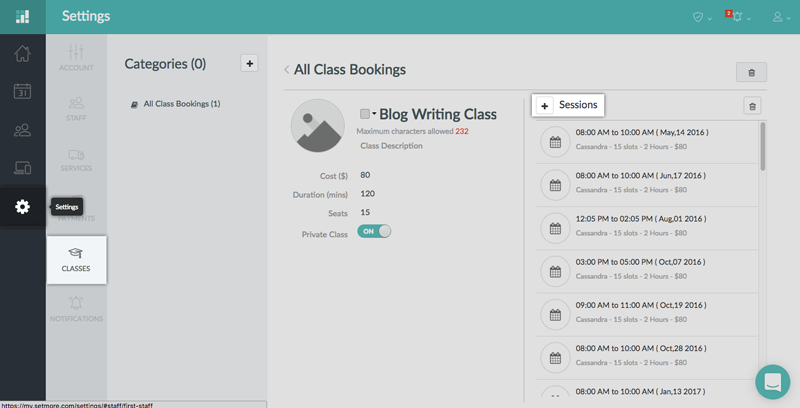 You can also specify an end date, after which the class sessions will stop recurring. When everything looks good, click outside of the submenu and click "Save Changes." 4. 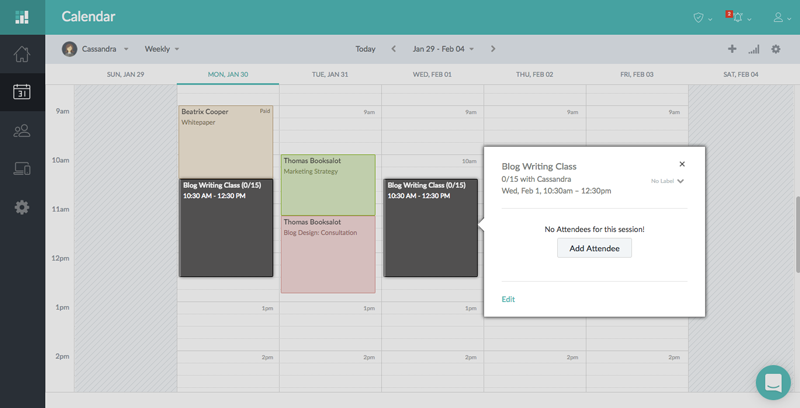 The calendar page will now reflect all of the class sessions up until your specified end date. You can click each session to add attendees for that specific session.